Does Sushi Tomo have the best Sushi in Pittsburgh? 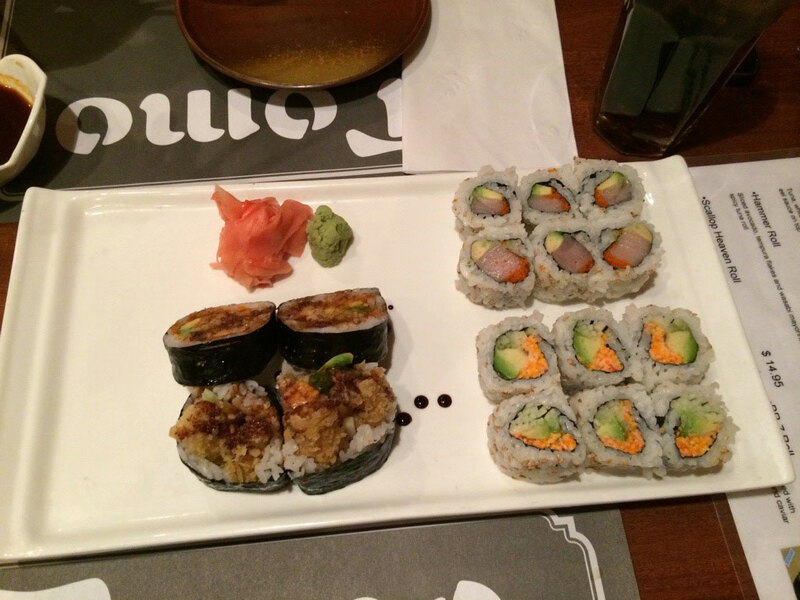 For years, our friend Sarah has told us that the Best Sushi in Pittsburgh is on McKnight Road at Sushi Tomo. Despite that we live just minutes away and drive by all the time, we had never been until recently. It’s possible that we overlook Sushi Tomo because of its location – it’s on the side of McKnight Road that no one pays attention to – and drab exterior. Rest assure, the interior is not as drab. We were promptly greeted and sat. Our waitress has a great understanding of the menu and was very upbeat. In my experience, upbeat waitstaff mean one of two things (A) they are putting on a face to get a great tip and it’s all just an act or (B) they thoroughly love what they do. For our server, it was certainly the latter. She made us excited to try things and frankly did a good job with her upsell to the featured roll of the night. For an appetizer, I ordered the lightest option on the menu. 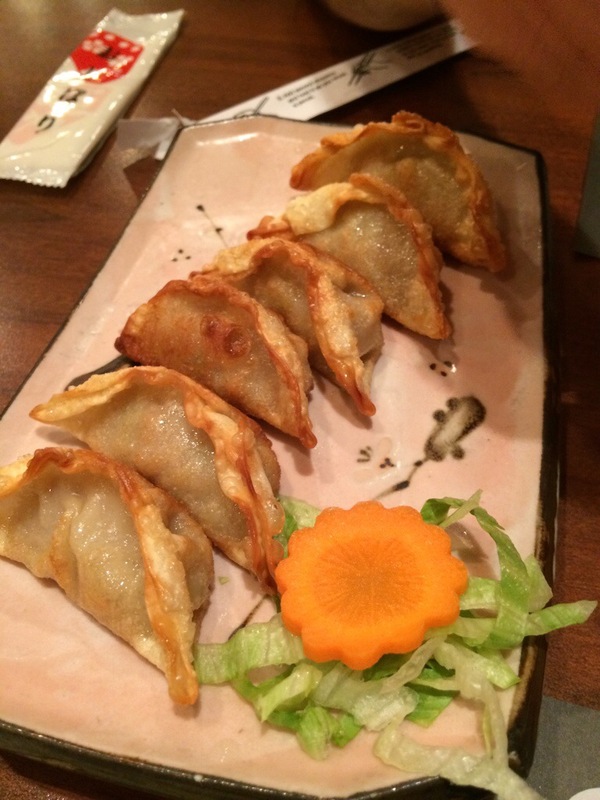 Spring rolls weren’t an option so I opted for the Gyoza, a pan fried pork dumpling. While prepared differently, they were certainly preferential to the steamed vegetable ones we had at Lin’s Asian Fusion. TasteBudA and I split the order and awaited our sushi, which was delivered in no time. Our sushi arrived on two plates. The first a special rainbow roll that was being featured for the evening. 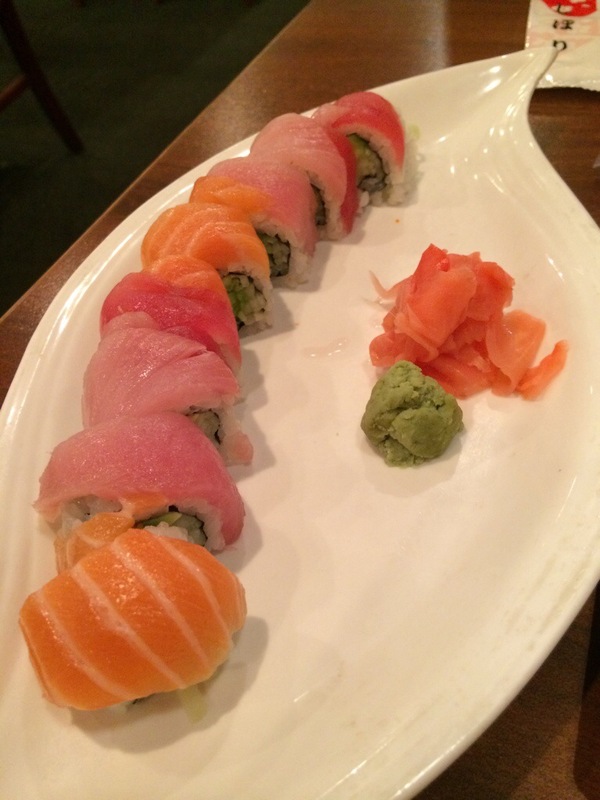 The fish was fresh and had all of our favorites on it – tuna, whitefish, salmon and yellowtail. With 8 pieces, TasteBudA and I each got 4 pieces and shared each of the fishes equally. Our second plate was a modified “Rock & Roll maki combo”. Since the Rock & Roll had eel which neither of us are fond of, the waitress allowed us to substitute the Allegheny Roll for just an extra $1. Of course, I didn’t explain the components to TasteBudA, who has only recently taken a liking to sushi. Luckily the caviar didn’t both him and he enjoyed the roll. It was a little saucy for my liking, but had good flavor. Also in the platter were two other rolls – a spicy California roll (Crab meat, cucumber, avocado, & caviar) and a Village roll (Yellowtail, avocado, & caviar). Both of the accompanying rolls were good, standard items. In the end, the maki combo proved too large for us to finish. Perhaps I need to start ordering more conservatively and progressively add-on items over the course of the meal. When all was said and done, we were very happy with our experience. We left our great waitress a generous gratuity and headed out to meet friends for drinks. Was it the BEST SUSHI IN PITTSBURGH? It was the best we have had in Pittsburgh – but that isn’t with much of a sample set. Look for us to have more adventures with sushi before we start tossing around the “Best Sushi in Pittsburgh” title.